By and large the ‘Settings’ sequence presents a chain of backdrops against which personal events and dramas were played out. 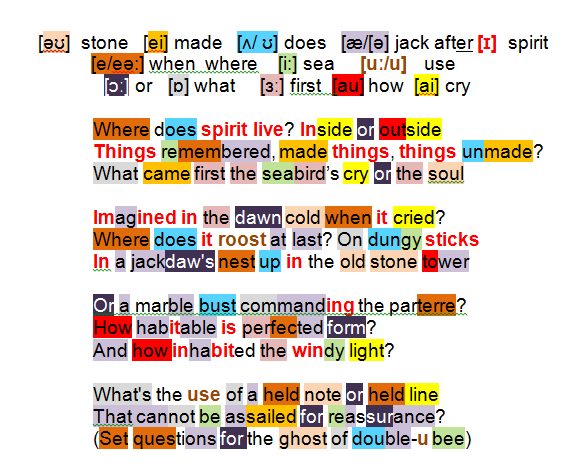 Within the dynamic period preceding Seeing Things when Heaney deliberately swooped on anything that stimulated memory or association (DOD 320), he allowed himself to be transported back by the poems that ‘came on’ to the sites, subjects and emotions of early experience, whence he weighs up what ‘in time … was extra, unforeseen and free’ (Markings I). This poem breaks the mould. Heaney focuses on the ‘spirit’. Following his current ‘method’ of seeing things through fresh eyes, Heaney soul-searches, setting the current piece on a higher abstract and metaphysical plane. He refers seven unanswered questions to a highly respected precursor. If the general tone is serious the referral is more tongue-in-cheek. Heaney acknowledges the actuality of some immaterial power source he calls spirit; hence his initial question is not ‘What is spirit’ but rather ‘where does one find it’? Beyond the question of location he wants to know: whether ‘spirit’ is internalized and restricted (inside) or external and universal (outside); whether it is derived from within human experience (things remembered), and/or present in things created (made things); and/ or present in things as yet only figments of the imagination (things unmade). He questions philosophical theories that place existence before essence (What came first the seabird’s cry or the soul?). Whilst the mew of a seagull in the dawn cold might betray the presence of a seabird, what if he only thought he heard it? Does previous sensory experience prove existence in imagined form? What becomes of the spirit after a person’s death? Does it migrate to its own resting place (roost)? Is it to be found in the meanest of habitats (On dungy sticks In a jackdaw’s nest) or in some iconic retreat (old stone tower) haunted by the ghost of some spiritual precursor (enter W.B Yeats akin to The Master of Station Island)? Is the spirit to be sensed in the treasure house of classical theatre (a marble bust commanding the parterre)? If, once written down, everything created by musician (held note) or poet (held line) were not open to revision for personal reasons (assailed for reassurance), then What’s the use? If Heaney doesn’t know the answers, he knows a man who might (Set questions for the ghost of W.B.). ‘Did you ever go through this kind of soul-searching, brother?’ he asks. He chooses Yeats as a kindred spirit, celebrated for his powers of intellect and poetic creation, his considerable work on poetic forms and systems, his promotion of all things Irish, his global celebrity (Nobel Prizewinner, a status that Heaney will share four years hence). 7 questions followed by a parenthesis that mimics an ‘Advanced’ level question!